You never can tell what will set off a round of Top Ten List making for me, especially since I decided that they didn't all have to be about books. This time someone on TV said, "I'll cross that bridge when I get to it," and off to the races I went. My mother hated bridges, and if she ever made up a list of them, it would be of the ones she most hated to cross. I think I didn't inherit that dislike. Well... if I were ever to get on a bridge that goes on world without end amen with no land in sight, I might start feeling a mite antsy, but I haven't. This week, I'm going to share my favorites of the bridges that I have crossed. I'm going to list them in order of when they were crossed, and the captions under most of them will lead you to more information about the bridge if you're interested. Naturally you can click on the photos to see them in more detail. The first bridge on my list has lingered in my mind for a long time. 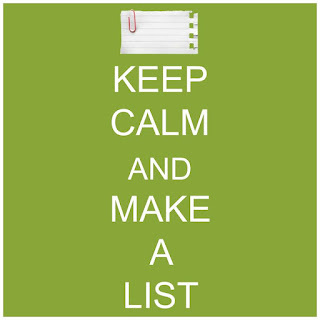 Let's start with it. 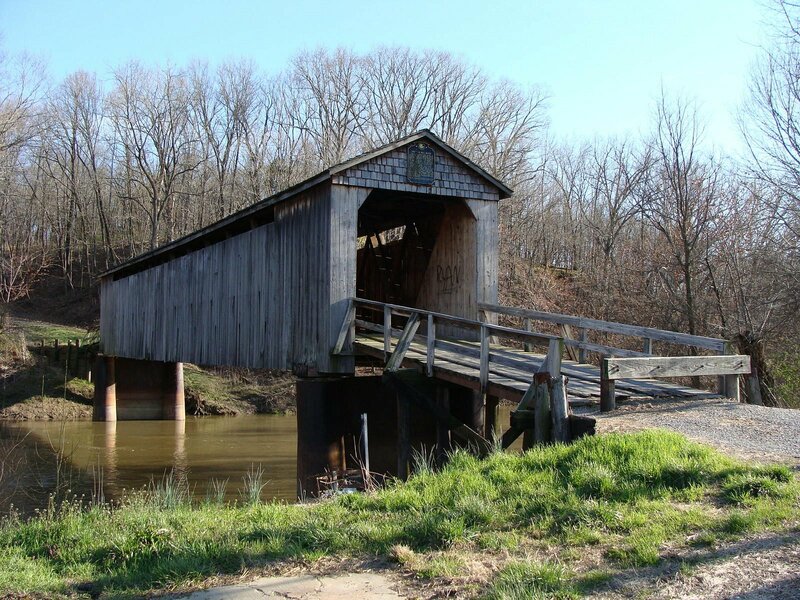 A wooden single-lane country bridge, Illinois. If anyone in my family ever took a photo of the bridge southwest of the little farm town where I grew up, I couldn't find it. This photo comes remarkably close. The bridge back home was old, it was wooden, it was single lane. There were no guard rails. 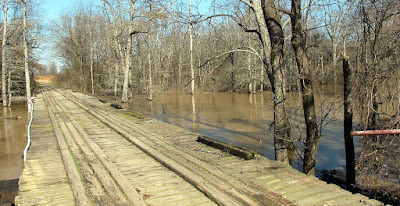 It was narrower than the bridge in the photo, and as Grampa drove his pickup across it, the boards would rumble and pop. The bridge went through some woods and crossed Flat Branch Creek. In summer, it was like going through a humid, green, mosquito-infested tunnel. One winter Grampa took me for a ride in his pickup to take a look at how bad the flooding was out in the country. It was bad. So bad that you couldn't see this bridge at all when Grampa drove us over it. I still remember the wrath visited upon his head when we got home and my grandmother found out what he'd done. (My grandmother was doing such a good job that Mom didn't have to contribute a word.) Hopefully that bridge has been replaced by now! Thompson Mill Covered Bridge, Illinois. The Thompson Mill Covered Bridge is a few miles from the farm town in which I grew up. It was built in 1868 and crosses the Kaskaskia River. The first time I visited this bridge, I was quite young, and even then it was blocked off so you couldn't drive across it. My grandparents and I walked across it, and it gave me the creeps. I've never really understood how covered bridges came to be thought of as romantic. I know Mom didn't think they were; she stayed by the car the whole time we were there! The first time I crossed the Golden Gate Bridge, I was two, so I don't remember it. The next time, I was ten and on our family's great cross-country adventure. 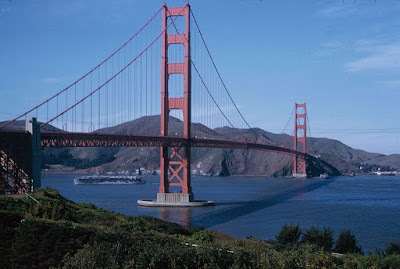 I don't know which was cooler: going across the Golden Gate or traversing the roller coaster series of hills in San Francisco to get to the bridge! 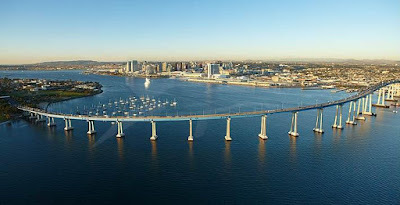 The Coronado Bridge in San Diego, California is also one that I've crossed a few times. Crossing #1 was on my first visit, and it was my first experience of a bridge with a very steep approach. On my way back to the hotel, a rather large U.S. Navy ship was going underneath, and that steep approach suddenly made all the sense in the world. Hampton Roads Bridge and Tunnel, Virginia. 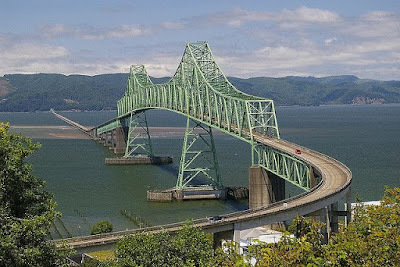 Astoria-Megler Bridge, Oregon & Washington. Denis and I crossed this bridge while exploring the Pacific Northwest. It's another bridge with a very steep approach. In fact, as we passed multi-story apartment buildings, I was trying not to look in people's bedroom windows. Then we crossed the Columbia, one of my three favorite American rivers. All the shipping went under the tall section of the bridge, which soon went back down to a normal type bridge-- only both guardrails were lined with cormorants. I suppose the fishing must have been really good from that section! 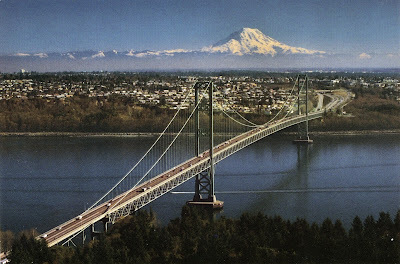 On the same trip, Denis and I also crossed the Tacoma Narrows Bridge which goes through a particularly gorgeous (and windy) part of Washington State. In the photo, you can see Mt. Rainier in the background. Not only did I love the scenery, I was smiling because I knew that we were crossing a bridge known as Galloping Gertie. Ever heard of her? 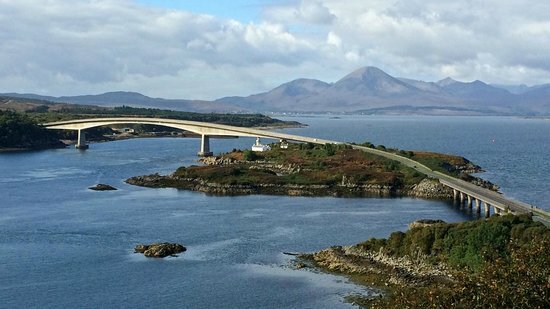 The Skye Bridge connects the Isle of Skye to the mainland of Scotland at Kyle of Lochalsh. When the wind gets really bad, the bridge is closed to traffic. (Ask me how I know this.) But that first time across, looking down at that lighthouse and out across the incredible view, was sheer magic. I remember that day as being filled with waterfalls and rainbows. A day I shall never forget. 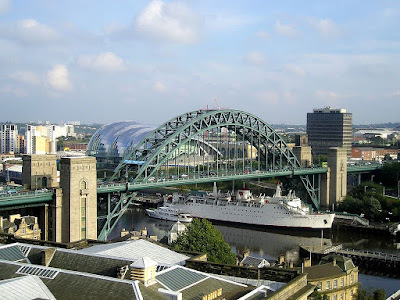 The Tyne Bridge is one of seven crossing the River Tyne to connect Newcastle upon Tyne to Gateshead in northeast England. On our way back from the Highlands of Scotland northwest of Inverness and on down to visit a dear friend in Durham, our route took us across this bridge, right in the heart of a busy city. It was extremely difficult to gawk at the bridge and all the buildings at the same time, but I tried my best! So many things to see in London, so many crowds! But even though my head was buzzing with everything I'd seen in the one day of sight-seeing that we had, I couldn't help being impressed by Tower Bridge and the weight of history all around me. Yes, I did leave some bridges out. I think that's the whole point of these Top Ten lists, don't you? 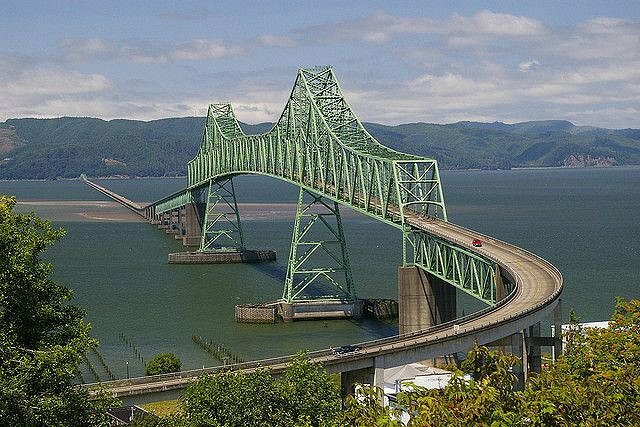 What bridges have you crossed that would make your own personal Top Ten lists? Inquiring minds would love to know! I have crossed the Sydney Harbour Bridge many times - for about a year I needed to cross it twice a day by train to get to work. I've also walked across it (including once in protest), driven under it in a tunnel and climbed to the top of it. Happily it's got a great view. 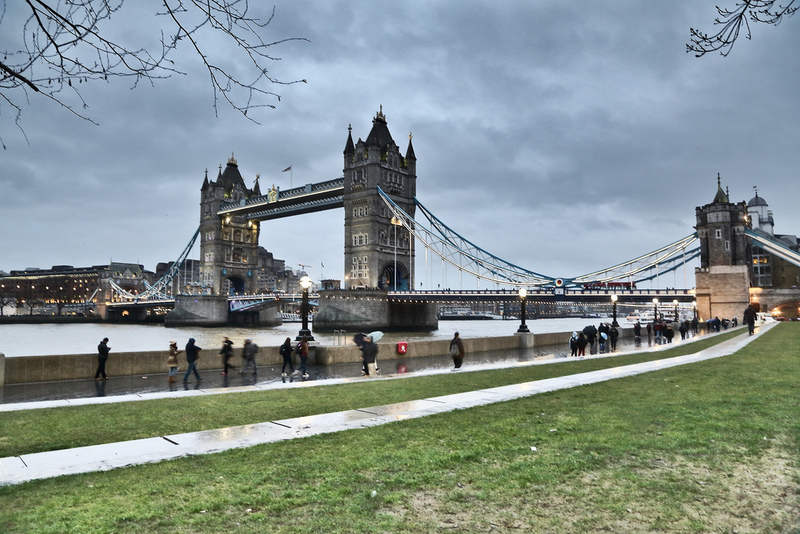 If you have access to Netflix keep an eye out for the Architecture Top 10 documentary series - it has an episode on the world's 10 greatest bridges and it's a great watch if you like that kind of thing. At least 2 of yours are in there - possibly 3 or 4 (my memory is not what it used to be). 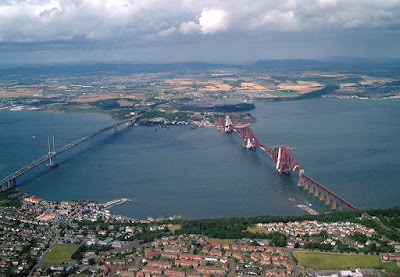 Probably the Forth Bridge and the Golden Gate. I wouldn't mind adding the Sydney Harbor Bridge to my list, but I haven't the patience or intestinal fortitude for a plane trip that long. Those are gorgeous bridges, Cathy. 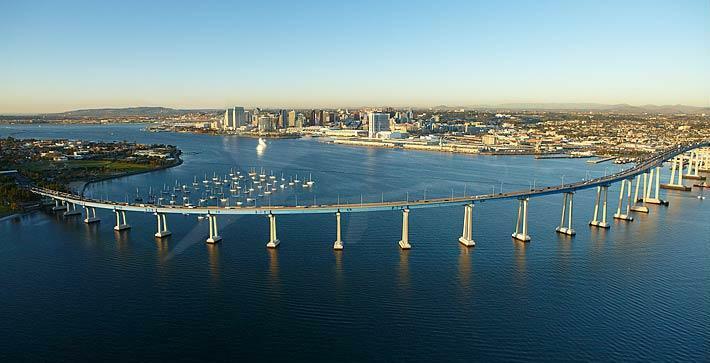 Glad you included the Coronado Bridge; it is unique, I think. I also think the Chesapeake Bay Bridge is spectacular. We were in the right part of the country that time when we went over the Hampton Roads Bridge, I was hoping to see the Chesapeake Bay Bridge, too, but it didn't happen. Great photos! I love bridges, my favorite one is the Skyway Bridge in Tampa Bay, Florida. I have yet to make it down to Florida. I've often wondered how I'd deal with driving to Key West. One bridge I remember walking across was in Washington, DC. Denis and I walked from Arlington National Cemetery to the Lincoln Memorial. Walking across the bridge over the Potomac was rather sobering, especially since it was only a few months after 9/11 and we'd driven past the Pentagon to get there. Don't tell anyone, but I cried as I looked up at the statue of Lincoln. I haven't traveled as much as many of you. I went to college in Vermont and am fond of the old bridges and covered ones that I saw or drove through. I am fascinated by how the Hampton Bridge and Tunnel works. It looks like it just ends. I don't have feelings one way or the other about bridges into and out of Manhattan. Nothing is spectacular. I love those photos of bridges in Scotland, such a beautiful place. 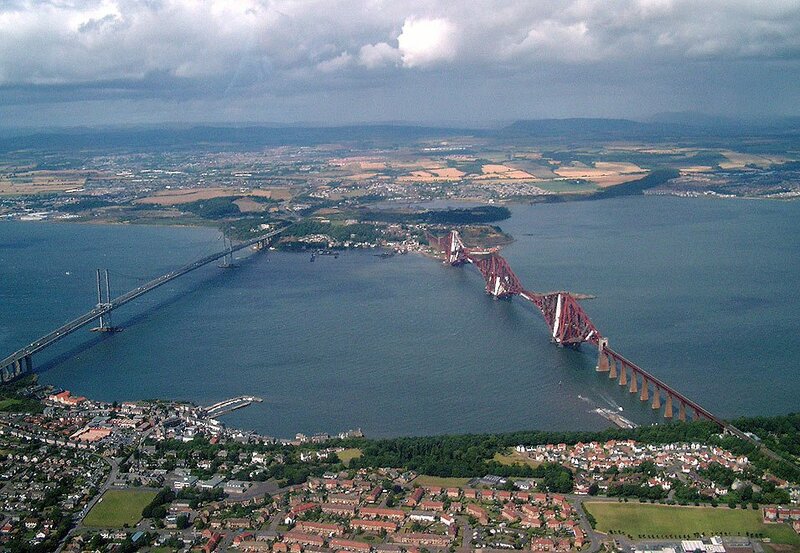 Any excuse to say the Firth of Forth a number of times. 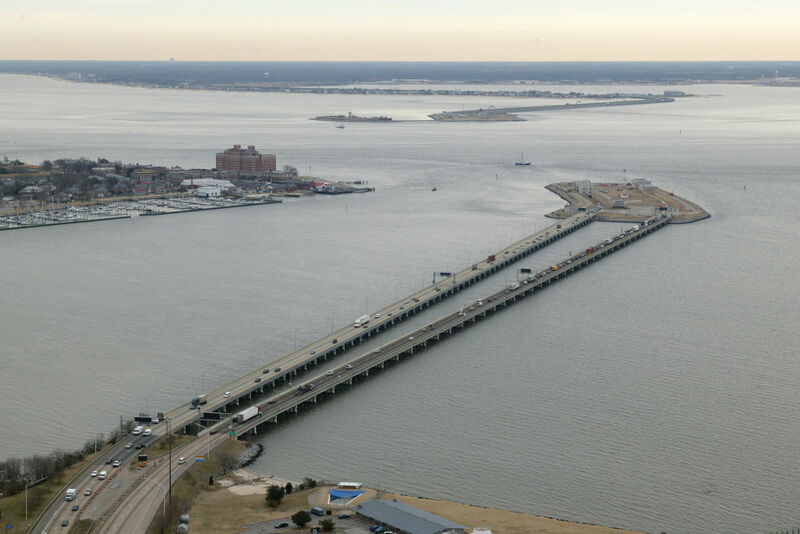 Yes, Firth of Forth is a fun phrase to say, and the Hampton Roads Bridge and Tunnel looks like you should be wearing a personal flotation device before you embark because it seems to just...end... out in the middle of the water! Yep! The Hampton bridge and tunnel deserves a closer investigation.